This is a quick tip. If you’re like me, your inbox is a fright. 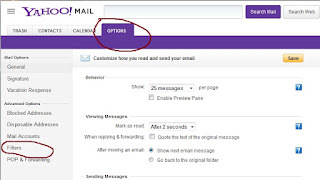 You scan through it to find emails that are important to you or that fit a certain criteria. Then you move ones you want to save for future reference to a specific folder. Maybe you have a ‘marketing’ folder, a ‘writing’ folder, a ‘health’ folder, and so on. Sorting each email is time consuming. 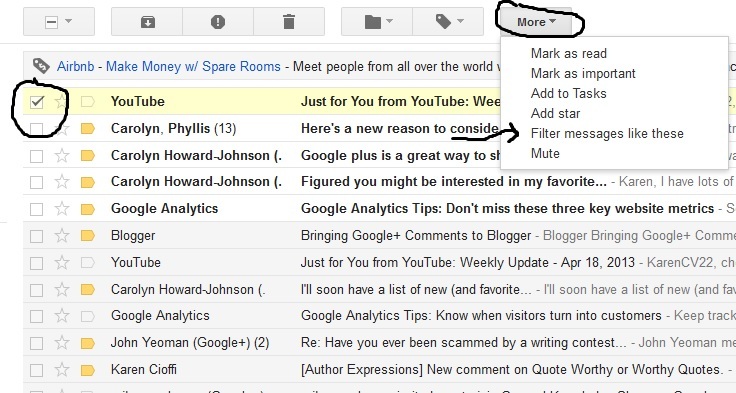 Well, Gmail and Yahoo both have Filters that sort incoming emails for you automatically. Maybe I’m a slow learner, but I just caught on to this time-saving tool and I love it. In Yahoo just look for Mail Options (see Image 1). Click on Filters (on the left, circled in red) and fill in your criteria. It's pretty self-explanatory. Image 2 gives you an idea of how it looks and what to do. Gmail is similar. 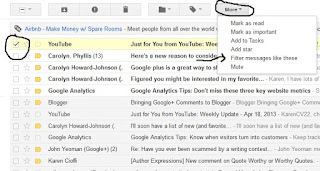 In your Gmail account you have to click on an email though, then go to ‘More.’ Scroll down to Filter messages. See Image 3 below. I hope this helps you manage your emails and time a little better.